In order to link your domain to your external (web)server at minimum 1 IP address from your server is required. You can request the IP address from your hosting provider. After receiving the IP address you can supply it in the DNS settings of your domain name. 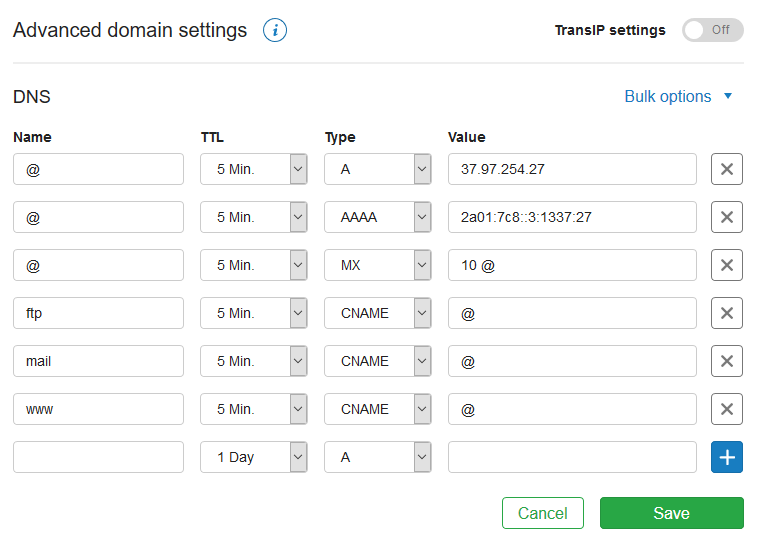 When using the TransIP nameservers for your domain you can manage your DNS settings directly from the control panel by following the steps below. Scroll down on the right side down to the 'Advanced domain settings' section and change your DNS records as desired. If you see 'Domain settings' instead of 'Advanced domain settings', then first disable the option 'TransIP settings'. Click on 'Save' in the bottom right of your DNS settings. When first configuring a domain, a default IP address will be set. This is a default IP address belonging to TransIP which causes your domain to display the reserved page. Behind the root (@) A record you can replace the current IP address with your own IP address. Please note that if elsewhere in the DNS records @ is listed as value that this record will also use the new IP address. It’s also possible to create subdomains in the DNS-settings. You can add the name of the subdomain in the 'name' field (.e.g. 'www', your domain name will automatically be added). In order to configure all subdomains that haven’t been configured yet all at once you can use a wildcard by using the name '*' for the DNS record. The A-record aside it’s also important to configure your IPv6 address in the DNS settings. Some visitors connect to your website using the IPv6 protocol. In order to properly make this connection you require an AAAA record which points to the IPv6 address of your server. If you don’t have an IPv6 address, it’s best to remove the AAAA record with the name @ altogether. When changing the DNS settings it takes a maximum of 24 hours before the changes have taken affect globally due to the processing time and caching on nameservers globally. Unfortunately we have no influence on the processing time.